Gotong batangas is a unique kind of goto where the it differs from the goto we all know which consists of rice gruel or porridge with beef tripes. This dish is very similar to “beef papaitan” where it is a soup with beef innards. The beef innards used is usually beef tripe and combined other innards such as beef intestines, kidney, heart and liver. But some also used beef skin and parts of the cow’s head such as cheeks and tongue. If you have visited Lipa City in Batangas specifically the Lipa pulic market almost all the cooked food sellers serve gotong batangas and they vary on the cow parts used in this dish. 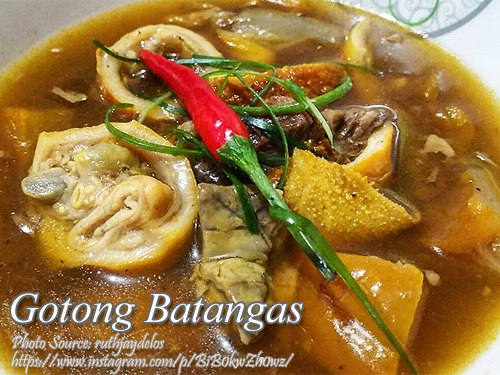 You can also request what kind of beef innards you want to put in your bowl of gotong batangas. One tip I’ve learned to make your gotong batangas tasty, you should use rice washing instead of water in cooking the beef innards. To make the rice washing, just collect the liquid from washing the uncooked rice before it is cooked. Clean beef tripe and intestines by rinsing in running water and rub with rock salt. Pour vinegar about one cup on the both innards and let is stand for about 15 minutes. Use a knife or a brush to clean the green stuffs on the tripe and other impurities. Rinse in running water and parboil for about 15 minutes. Discard water and rinse again and drain. Put water in the pot and add all the meat ingredients such as tripe, beef cheeks, intestines and kidney then bring to a boil. Add also the bay leaf, crushed garlic, crushed ginger, ½ tablespoon rock salt and peppercorns. Adjust heat to medium and as soon as the scum floats on the surface, remove them. Then lower the heat and simmer until tender approximately 1 and ½ hours to 3 hours. When tender, remove the meat, tripe and innards from the broth and slice into strips. In a pan, heat oil and saute garlic, onion and ginger until fragrant. Then saute the meat, tripe and innards for about 3 minutes. Then add the annato powder and half a cup of vinegar. Stir for another 2 minutes. Then put the sauteed meat and innards in the pot of broth and cook in medium heat for another 10 minutes. Season with salt and pepper. Transfer in individual serving bowls and serve hot with chopped onions, calamansi and siling labuyo.